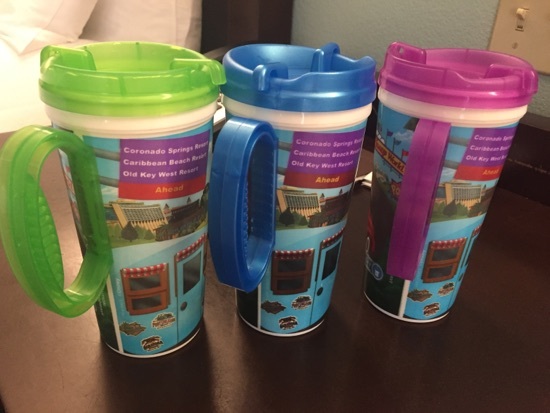 This morning I woke up at the much more reasonable time of 7am and went for the morning coffee at el centro in our refillable mugs. Today we were spending the morning at hollywood studios. 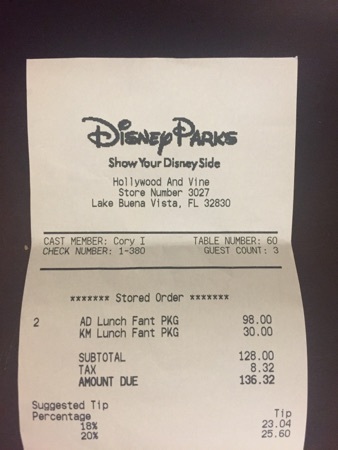 We had a lunch reservation at Hollywood and vine with the Disney junior characters. This place doesn't often get rave reviews but DD is a huge Doc and Sofia fan so it was a must do for that reason. 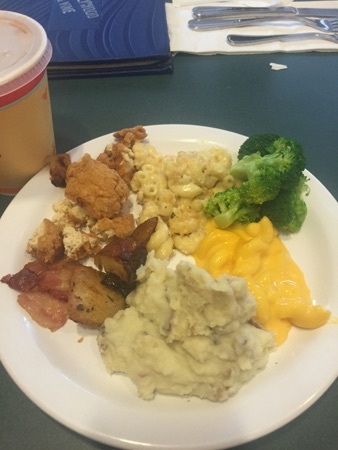 DD had a plate with shrimp Alfredo macaroni, broccoli, Mac & cheese, mashed potato, chicken nuggets and potatoes. 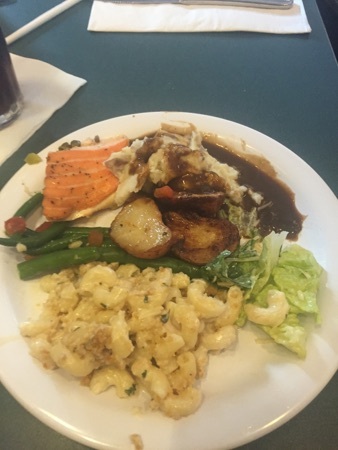 My first plate had mashed potato and gravy, Caesar salad, shrimp Alfredo macaroni, green beans, potato and baked salmon. Everything on this plate was really tasty, especially the shrimp Alfredo macaroni, that was so good, I could have eaten a whole plate of it! 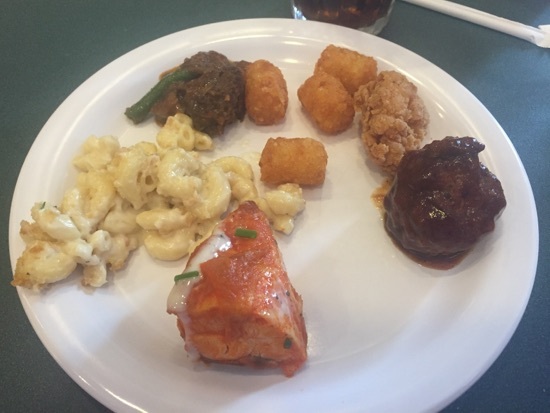 This plate included tater tots, a chicken nugget, barbecue meatball, buffalo chicken, more of the macaroni and beef stew. The meat items in particular were very good! 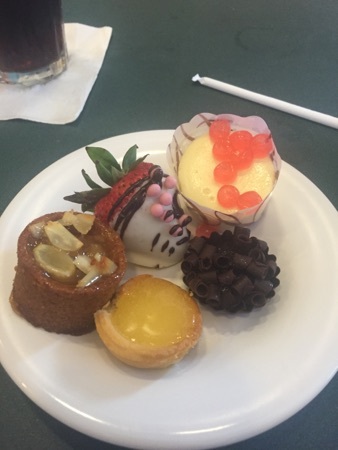 Then came desserts. There were chocolate covered strawberries, a chocolate peanut better tart, a passion fruit tart, an apple pie and a strawberry cheesecake. The passion fruit tart was the best by far but they were all pretty good. Wasn't too impressed with the apple pie but that's just because I'm not a fan of cinnamon. 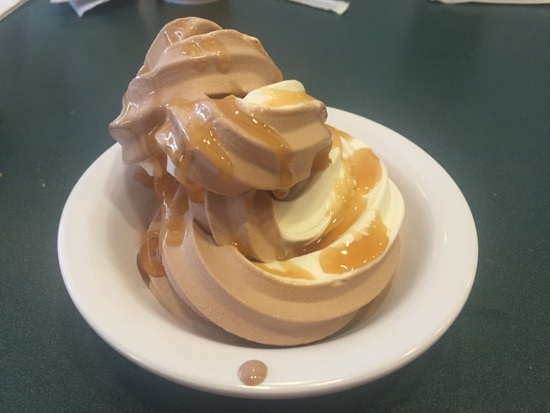 There was a soft serve ice cream machine with a choice of chocolate, vanilla and twist which you could help yourself too, and also caramel and chocolate sauce to top it with. Overall we really enjoyed this meal. We came with low expectations when it came to the food but were pleasantly surprised. The character interaction was fantastic as usual and we saw all 4 characters twice. The cost was $49 per adult and $30 for a child. We wouldn't have paid cash for it but for the character interaction alone we feel it's worth 1 table service credit. 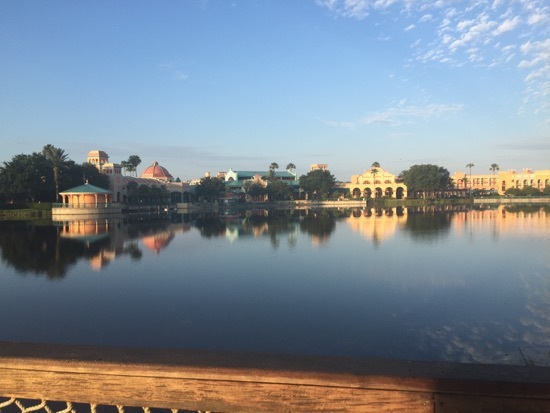 We spent the afternoon back at Coronado springs where DH and DD played in the pool and I (stupidly) watched the England match. We decided to head to magic kingdom for the evening where we grabbed dinner from caseys corner. I got the regular BBQ slaw dog with fries, a bottle of water and swapped my dessert for another bottle of water. 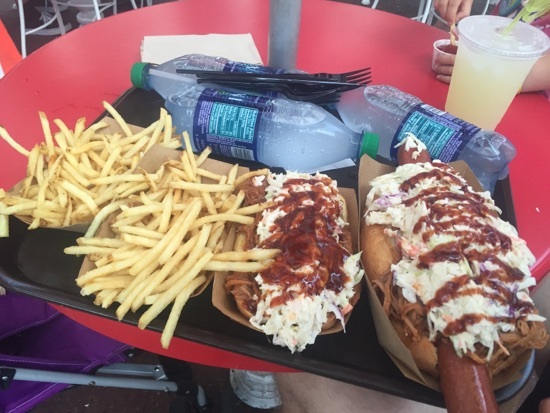 DH got the footlong BBQ slaw dog with fries, lemonade and also swapped the dessert for a bottle of water. The choice of desserts was pretty poor here and they were out of cotton candy so we decided water was a better choice. DD shared with DH as I knew she wouldn't eat a hotdog to herself. These were pretty good but they were huge! Well especially the footlong one. The hotdog was topped with pulled pork and coleslaw and squirted with BBQ sauce, this topping was really tasty but there was too much of it and it made it really messy to eat! This should have come to $38 but we used 2 quick service credits. We didn't really eat a lot today, we're going to have to make much more of an effort with these snack credits! Yes the hotdogs look huge, great day again looking forward to day 4. Wow those hotdogs look good! New York, DH is 40! Wow, looks great! We also enjoyed H&V, I know there are some terrible reviews on it but we enjoyed the food and agree the character interaction was fabulous! A must do with young kids, my 4 year old loved it but think he will be too old on our next trip. For a buffet the food looked really nice and the hot dogs just look so filling and delicious. Must try Casey's Corner. New Photo Added by missdopey - 28 Jun 16 8:56 PM.